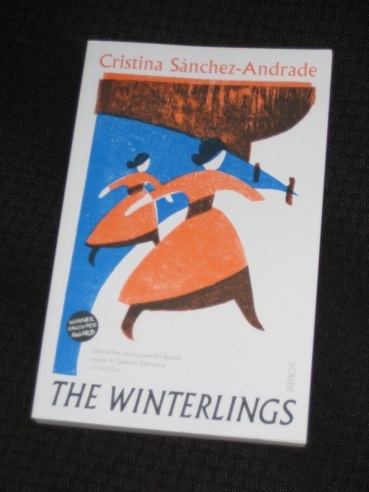 Cristina Sánchez-Andrade’s The Winterlings (translated by Samuel Rutter, review copy courtesy of Scribe Publications) begins with two women returning one morning to Tierra de Chá, a small village in Galicia. After a few years in England, and many more in the city of Coruña, the sisters have come back to claim their grandfather’s house and settle down to a quiet life in the countryside. “Are you calling us sheep?” said the Winterlings in unison. The priest took in everything with a glance: the house, the orchard, the chickens. The fig tree twisted and sprawled over the house, its branches invading the windows without panes. “We’d be even more lonely without loneliness,” they replied. “We’re all sheep, or we end up becoming them. It’s good to be part of the flock; it’s warm and gives comfort,” said Don Manuel, taking up the handle of the cart again. The crux of the novel is the way the arrival of the Winterlings acts as a catalyst to bring festering wounds to the surface. Known but unknown, the sisters pose a problem to the villagers, who find it hard to work out how to handle them; after all, it’s not often that English-speaking, city-dwelling women cross their paths. More than this, though, it’s the mysterious death of the girl’s grandfather, Don Reinaldo, that really concerns the locals. Many of them remember a promise they made to the old man, and now they fear that the sisters might insist on holding them to their word. The sisters have plenty of dark experiences overshadowing their present, but one in particular has followed them to the village – and may eventually bring their downfall. The Winterlings is a book of deaths and secrets, with the two often going hand in hand. Some, such as the fate of poor Don Reinaldo and the truth behind Dolores’ short-lived marriage, are slightly sinister; others, such as what the dental mechanic Mr. Tenderlove gets up to in his free time, slightly less so. It’s also a slightly bizarre story in places, with a grotesque obsession with teeth, brains and witchcraft (not your average country romance…). While I found the going a little slow in the first half, it gets there eventually, but the constant back and forth nature of the novel, added to the very slow release of information, can make for frustrating reading at times. Another issue that puzzled me a little was connected with the movie (Pandora and the Flying Dutchman) that Dolores hoped to work on. The film is real and was filmed in Catalonia in 1951, but the numbers don’t add up. Early in the novel, we’re told that the sisters left for England in 1936 and returned to Tierra de Chá almost thirty years later – meaning that the story should be happening in the early/mid sixties. Is this an error, or is the writer deliberately muddying the waters here? I’m honestly not sure. For a while, their hands intertwined in the soapy water, seeking each other out like fish, brushing against each other. “Are they my fingers or yours?” said one Winterling. “What difference does it make?” answered the other, after some thought. Intriguing, the suspicions of villagers even when one of their flock returns, that need to know everything, so claustrophobic! This sounds intriguing. Do you get to find out their secrets or is it left ambiguous. I’ve almost bought this on a number of occasions (it has a very striking cover for a start). I’m left with the feeling it’s an interesting read but not a vital one. Grant – Yeah, I’d say that’s about right. I enjoyed it, but probably not as much as I expected to given what I’d heard about it previously.